Jenggala Keramik offers unique design of fine ceramic for dinning wares. 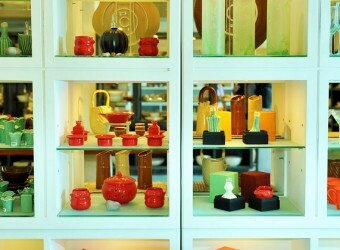 Jenggala Keramik produces high quality kitchenware, ceramic tableware, toilet articles and so on. The products have been used by many companies in the world. The head office is located in Jimbaran has a showroom and café facilities. You can enjoy tea, coffee, and light meals at the café. I always go to Jenggala Keramik when coming to Bali. I also bought many ceramics this time. Lotus motif is my favorite. There various color and variation available. I’m happy I got more tableware for my dining table. It’s also good for souvenir.